This entry is a bit of a cheat. I've been cooking Gary Rhodes' version of cottage pie for years. In fact, I've been cooking from all of Gary Rhodes' books for years. He gets a lot of stick, not least for his spiky hair and Tiggerish demeanour (in the early years at least), but I think he's brilliant - his books and accompanying TV shows from around the time of New British Classics are like masterclasses in their precision and attention to detail. 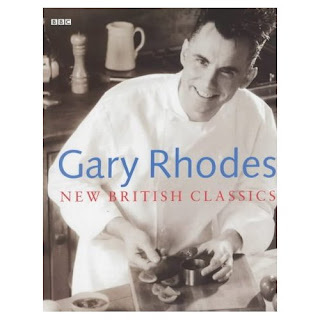 NBC is full of dishes which have since become trendy - think of last year's craze for Scotch eggs, and the flurry of interest in malt loaf (his recipe is the maltiest I've tried, much more expensive than buying Soreen, but worth every penny). For a book which is claiming to be British, there's a bit of tendency towards heavy French style jus, but he redeems himself in my eyes by not only including rib sticking stuff like suet puddings and fig rolls (where else are you likely to see a recipe for these?! ), but curly kale gets a mention, way before it was deemed suitable for anything other than animal feed. Anyway, back to cottage pie. As I say, it's a bit of a cheat because I've cooked his version so many times before. However, I'd been looking forward to using up the remains of our Christmas rib of beef, and it seemed like just the thing after a long walk in the cold this afternoon. Just taking the book off the shelf and refreshing my memory reminded me why I preferred the version to the one I had been cobbling together since I was a child. For one thing, it includes tomato ketchup (banned when I was a child), and the flavourings - pungent and earthy rosemary and thyme, along with some ground cinnamon for sweetness - work equally well with beef (cottage pie) and lamb (for shepherd's pie). Changes? I used beef stock from the rib bones instead of jus, anchovy ketchup instead of Worcestershire sauce and a few cooked lentils (to eke it out a bit and to get some extra nutritrion into my step-daughter). Oh, and this time, no mashed potatoes as I was feeling too lazy. Instead, sliced potatoes with their skins on, with a generous amount of grated cheddar on top. Totally agree his books are so reliable,recipes always work. I love this book - have had it for years and it has the BEST recipe for yorkshire puddings which rise like magnificent mountains that'll impress a crowd!